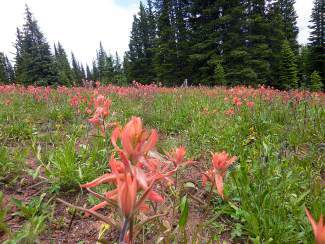 A rainy summer has meant that area wildflowers are plentiful and vibrant. EAGLE COUNTY — This year, hardy Vail Valley hikers have waded through drifts of wildflower confetti. And while the wildflowers have flourished from a rainy summer, muddy trails have deterred some guests and residents. Nick Courtens, senior horticulturalist at the Betty Ford Alpine Gardens, says that the number of flowers in Colorado has been unbelievable this year. Common wildflowers like paintbrushes are in abundance, as are some of Courtens’ favorites, like blue gentain, astors and other daisy varieties, cone flowers and lots of berries, which Courtens anticipates will keep the bears content this fall. Even unusual and hard-to-find wildflowers like mariposa lilies have popped up in generous numbers. Courtens has also spotted green gentains, which bloom sporadically every three to seven years. It’s not too late to take a wildflower hike, and Courtens has a few pointers to get the most out of it. Start early to avoid afternoon showers, and choose trails next to a water source since the best wildflower areas are generally found near water. Choose a trail ending in an alpine lake like Missouri Lakes Trail. His final piece of advice it to pack a wildflower book to help identify the rare flowers and berries. Identification of alpine plants is a common goal among hikers, but it is an elusive skill. While wildflower books can be extremely useful in identification and provide basic plant information, a deeper understanding of horticulture is necessary to understand alpine environments. The Betty Ford Alpine Gardens is trying to make this process easier by promoting fun and attainable alpine plant education. This local botanical garden is within an easy walking distance of Vail Village, and its abundant plantings are a wonderful way to see local environments and learn more about Vail Mountain without the muddy hiking boots. This July, the gardens debuted its education center to promote the preservation of alpine flora and the education of visitors, residents, scientists and students. Visitors will still be able to enjoy the exhibits that have been a mainstay at the gardens, but children’s and adult activities and education opportunities will expand as the Betty Ford Alpine Garden staff adapts to its new indoor space. Unlike some buildings, the education center will not detract from the natural setting but enhance the visitor experience. Especially in seasons when rain is inevitable, the education center will allow visitors to experience the outdoor setting comfortably. According to Liz Campbell, the garden’s director of development, there has been an “overwhelmingly positive response” to the building and the opportunities it provides. One of the highlights of the new center is the alpine house, designed to grow alpine plants year-round. The facility will allow winter guests to experience the summer alpine environment. While prevalent in Europe, alpine houses are rare in North America, and the new one at the Betty Ford Alpine Gardens solidifies the venue as an independent and world-class botanical garden. To further establish the Betty Ford Alpine Gardens as a premier botanical garden, the alpine house shows international alpine flora. Plants from the Alps, the Himalayas and alpine environments in South Africa and South America are highlighted throughout the center. “We’re trying to open people’s eyes to what’s around the world,” Courtens said. Campbell hopes that the education center will increase the number of visitors seeking an in-depth education about alpine environments. An extensive library also is being cataloged, and it will provide books about alpine plants and ecology, which will welcome both visiting scientists and laypeople. One of the Betty Ford Alpine Gardens’ projects partners them with the Bureau of Land Management. They are tasked to count the plant species in the Mosquito Mountain Range to determine how they are setting seed and whether or not the plants are continuing to thrive. But not every project is technical. Children can easily engage with conservation and environmental study. Kids are able to check out backpacks from the center and explore the children’s garden with magnifying glasses and other tools. Campbell even saw one family come back repeatedly on vacation to use the backpack service. Coloring, arts and crafts also are available for children. With an indoor environment in which to work, children can spend more time exploring the environment and learning from scientists. Programs at the alpine gardens also work with organizations like the Alpine Arts Center and local schools to promote children’s interest in the environment. The next several years should be full of exciting developments, including traveling exhibits and botanical illustrations to take to students. For more information regarding the education center, children’s activities and other events at the Betty Ford Alpine Gardens, visit betty fordalpinegardens.org or call 970-476-0103.